Blog What Kind of Life Lesson was That? What Kind of Life Lesson was That? I’ve been stewing on this all week: how will I share news of my flop of a musical “dream trip” to The Netherlands? It started out great. A friend’s Benadryl recommendation put me right to sleep on the plane. Not even an icy outdoor plane transfer in Reykjavik could jar me out of restfulness. The train from Schipol to Assen was only minutes wait, and our camp’s emissary, Gert, shuttled me directly to my B&B in Grolloo. The weather was cool and lovely. I took a 2km walk to town for dinner and had plenty of time to practice back at the inn before journaling and an early bedtime, two full nights before the opening of camp – plenty of time to conquer the jetlag which had plagued me last year. And that’s when the allergies kicked in. My voice became hoarse. I triple-dosed myself with Xyzal, Flonase, and Benadryl, then coughed myself to sleep. The next day was better. I was scheduled to get an “early” lesson from Wissam… but the time got hopped up by two hours with no easy way to communicate, so I missed the first fifteen minutes. All good. Things went well, and then I had a delightful rehearsal with pianist extraordinaire Tim Carey. We played straight through the ten-minute piece I’d memorized with only a couple of sections to fine-tune. But by the time I walked back to the B&B after dinner, my voice abandoned ship. Oh well. 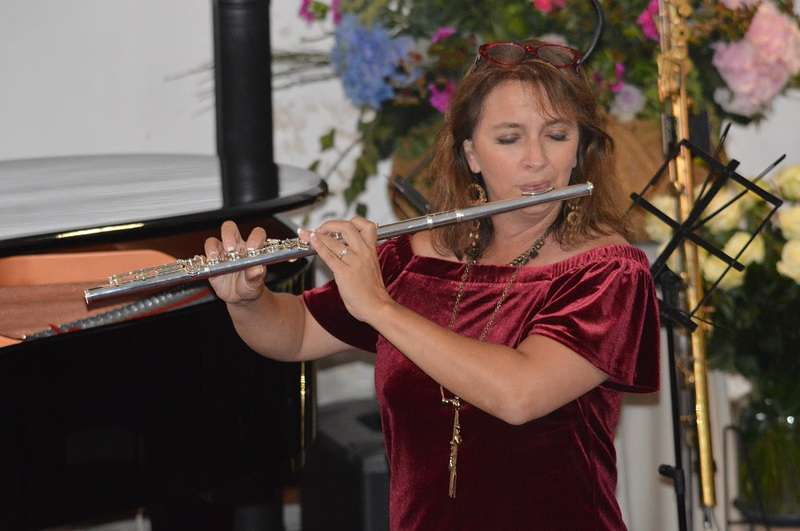 Speaking is not requisite to flute playing. I propped myself up on four pillows to sleep with dreams of the opening ceremonies on Tuesday night. 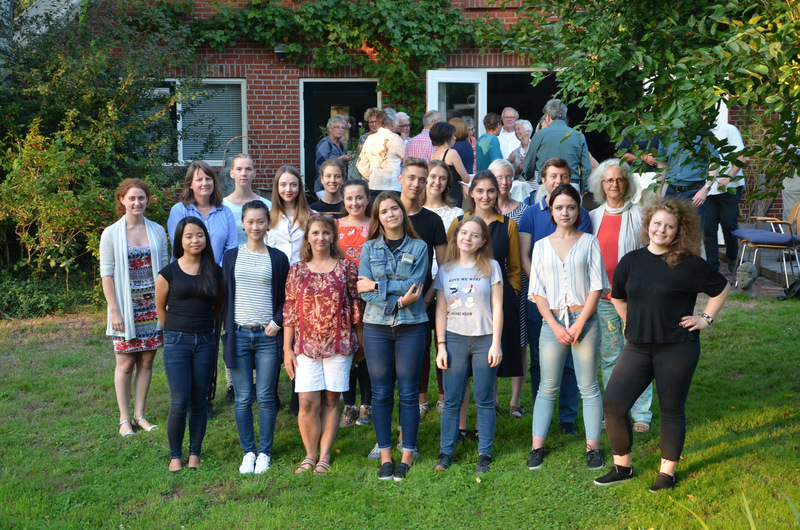 We were greeted by dozens and dozens of gorgeous flowers all around the home of flutemaker Eva Kingma, as well as dozens of townspeople in support of our endeavor. We learned that students were attending from Norway, England, China, Ireland, Switzerland, Germany, The Netherlands, Poland, Canada, Italy, Pakistan, Russia, France, and the United States (me). Five of us were returning students, so I tried to meet-and-greet the newbies as best I could sans voice. Upon arrival at Markhuis Community Meeting Center the next morning, we saw our instructors and Eva being interviewed LIVE for local television. 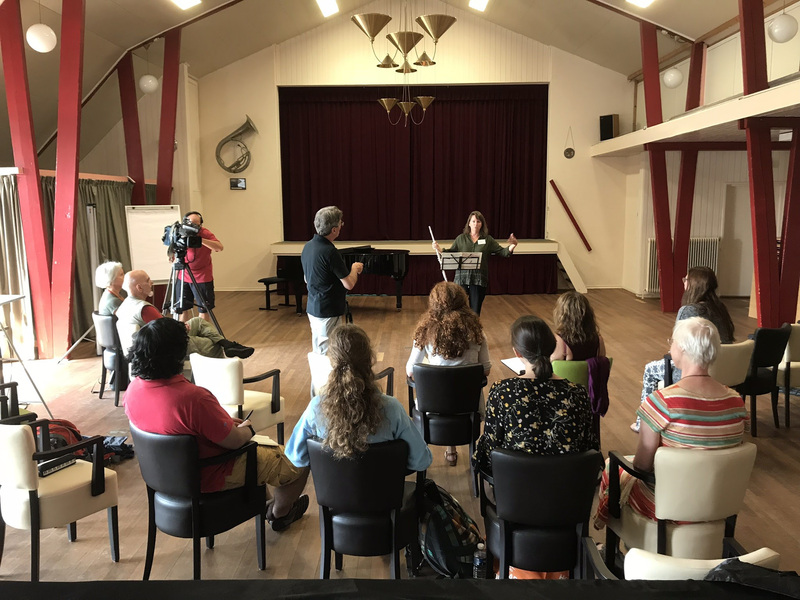 They even filmed a portion of Norwegian flutist Elin’s opening masterclass performance. Talk about pressure! Luckily my first performance was not scheduled until the afternoon, so I relaxed and enjoyed the “show.” Not one tiny twinge of nerves. So excited that all I’d worked so hard to prepare was about to pay off… Nothing could possibly go wrong. But when it was my turn, I took the “stage” in our classroom and my hands and arms quaked so hard it would take Charles Richter to measure. A sudden sweaty mess, the flute slipped on my chin, and my airstream came out in nanny goat pulses. I remember thinking, WTF? and telling myself, Just nine minutes and fifty-five seconds to go. The world closed in around me like one of those tunnel-vision scenes you see in a movie. All concept of intonation (or as James Galway says, “It’s better to play sharp than out of tune”) went out the floor-to-ceiling windows where the next-to-last sunshine of the week streamed into the room. I thought I’d prepared for everything. I slunk back to my chair in tears, while more hormones coursed through my body than all the pubescent teens in the room combined. Yet all I heard in my head was, I just want to go home. Now. Then I called myself a derogatory word and vowed to stick it out no matter what. Embarrassed. I should have played it safe like those other older players who merely “audited” the class. That evening we gathered again at Eva’s house for an evening of wine and impromptu fluting. 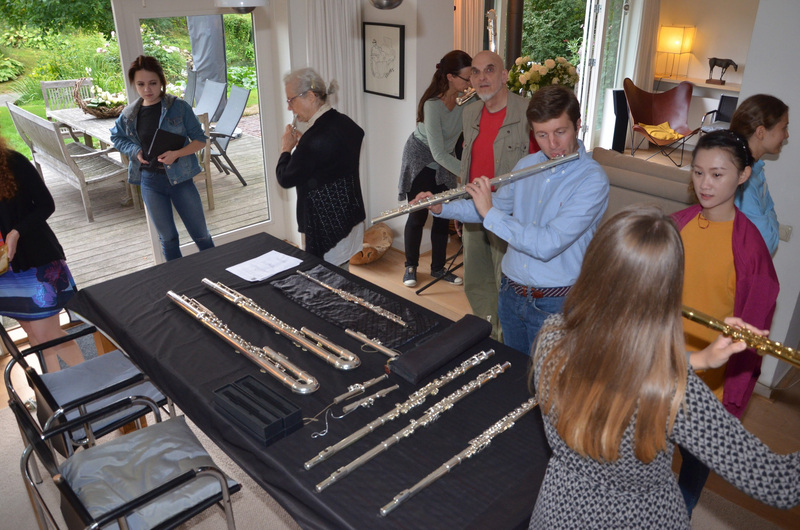 Several of the flutemaker’s wares were available to try: alto flutes, bass flutes, even a contrabass. The Italian who was wearing a watch that cost more than my car tried every one of them. The same place. The same time. A silence speaks to me. Shifting me to my writing musical dream world. I scribe perform inside the silence. Yesterday’s suffering transforms into compassion. Yesterday’s trial into today’s courageous act. And this time it went better. I began to dread the following evening’s church performance a little less. But the soggy weather mirrored my mood. 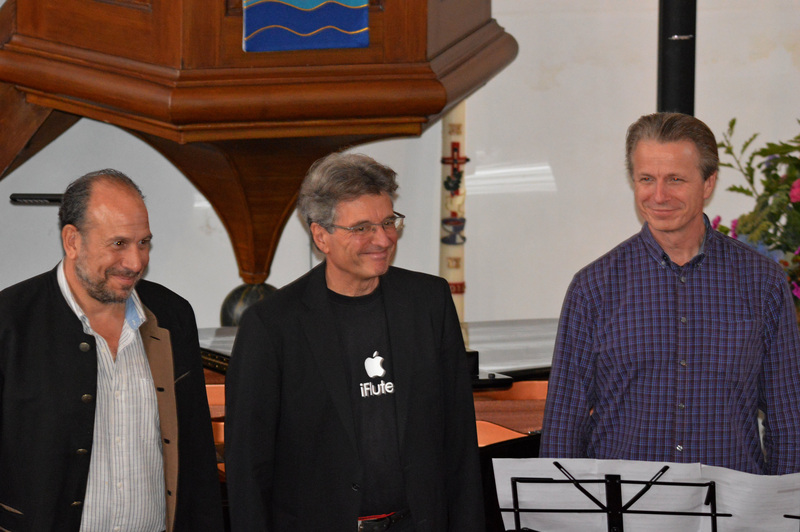 At the beginning of Friday’s public concert, the three instructors were introduced and I chuckled at (and coveted) Matthias Ziegler’s t-shirt. I was slated to perform second, and by this time one of the Irish girls had slipped me some chlorpheniramine maleate which punched at least half of my allergy fallout. (I think the equivalent here in “the States” is called Zyrtec.) I took the real stage wearing a beautiful Indian-style wraparound skirt (purchased on my Phenomenal Girlboss Mastermind retreat) and a red velvet blouse. At least I looked good. And sank my feet into the stone floor. And took several deep (less than) calming breaths. The notes came, musical lines sometimes interrupted by an unexpected need for air, but on the whole it was fine. Afterward I remember being relieved it was over, but disappointed that it had not lived up to my expectations. That I had not lived up to expectations. At the conclusion of camp we were all given flash drives with video recordings of our performances. I stuck mine in the pocket of my flute case and vowed never to share it. I almost wasn’t even going to listen to it myself. But after a week of emotional objectivity – and no clear insight on what the hell I was going to write in today’s missive – I decided to press play. Yep, there was that funny opening passage where one of the piano keys didn’t sound in the introduction. But I made my musical entrance anyway. And you know what? From the vantage point of an audience member, I couldn’t hear all the trash talk going on in the performer’s head. There were definitely moments where pitch favored Galway’s advice, but not as many as I’d been thrashing myself about for days and days. Again I thought, At least I looked good. So with hindsight 20/40 (which I’d trade for my progressive lenses anyday), I have to say I’m glad I attended. I’m glad I worked my patootie off to prepare. And even though it didn’t measure up (musical pun intended), I’d gladly force myself to do it all over again. Especially now that I’m armed with all new allergy meds. Because I learned that moments and events like this aren’t all about me. Even though I am painfully aware of every imperfection, I’m glad to say that a couple of the older auditors told me they’d been inspired to sign up as performers next year. A different one said she wasn’t ready for that quite yet, but she was going to practice to take the ABRSM exam in the winter, which would “force” her to create a daily practice habit. More music in the world. That sounds like a victory to me. 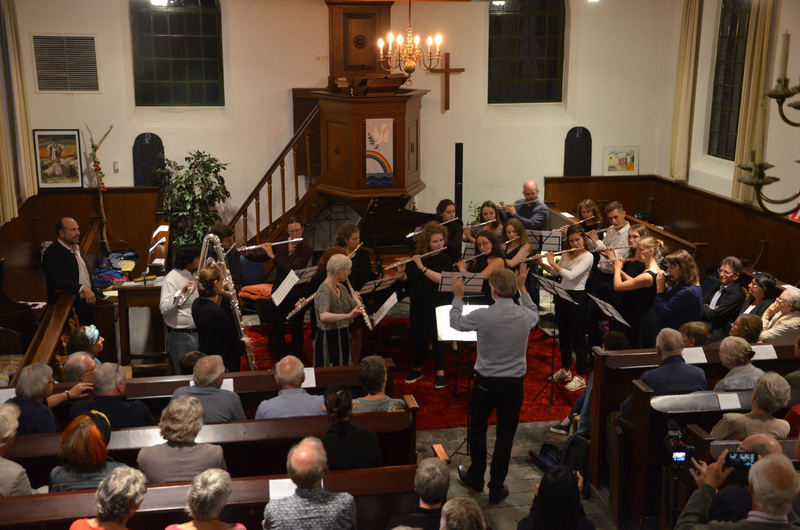 So in our closing Sunday night concert, I played farewell to Grolloo from the rear right of the flute choir (in between sucking back cough spray). Hope you’ve enjoyed the mini-musical tour. Another will be forthcoming in a year. Until then, I wish you blessings and inner strength and all the courage you need to take a big bold step out in the direction of your own Big Dream.